Zainab Salbi was eleven years old when her father was chosen to serve as Saddam Hussein's personal pilot, her family often forced to spend weekends with Saddam where he watched their every move. As a palace insider, Zainab offers a singular glimpse of what it is like to come of age under a dictator and provides an intimate portrait of the man she was taught to call 'uncle.' She watched as Saddam pitted friends, spouses and even children against each other to compete for his approval. She was sent to donate her mother's jewelry to one of the world's richest men, asked to erase her memory as she heard of crimes she was not supposed to hear of, and witnessed her mother hiding her tears lest it upset Saddam. Her mother eventually sent Zainab to America for an arranged marriage, to spare her from Saddam's growing affections, but the marriage intended to save her turned out to be another world of tyranny and abuse. Despite extraordinary psychological challenges, Zainab started over. She forged a new identity as founder and president of Women for Women International, a nonprofit organization for female victims of war, dedicated to providing women of war and civil unrest with the resources to become self-sufficient citizens and promote peace. Zainab has traveled and promoted her organization widely, speaking out on behalf of oppressed women around the world, but until now has never told this very personal tale. 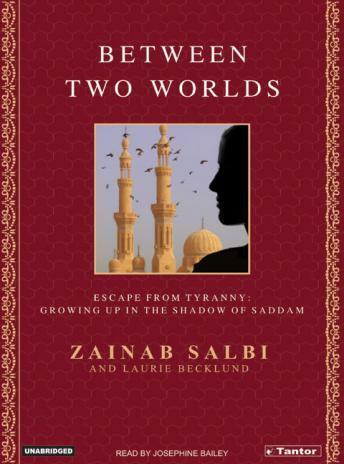 In BETWEEN TWO WORLDS Zainab Salbi reveals the tyrant through the eyes of a child, a secretly rebellious teenager, an abused wife, and ultimately a professional woman coming to terms with the horror of secrets her mother revealed only on her deathbed. Through her ability to come to terms with the child she used to be and dangerous world in which she managed to survive, BETWEEN TWO WORLDS emerges as a story of heroism like no other.